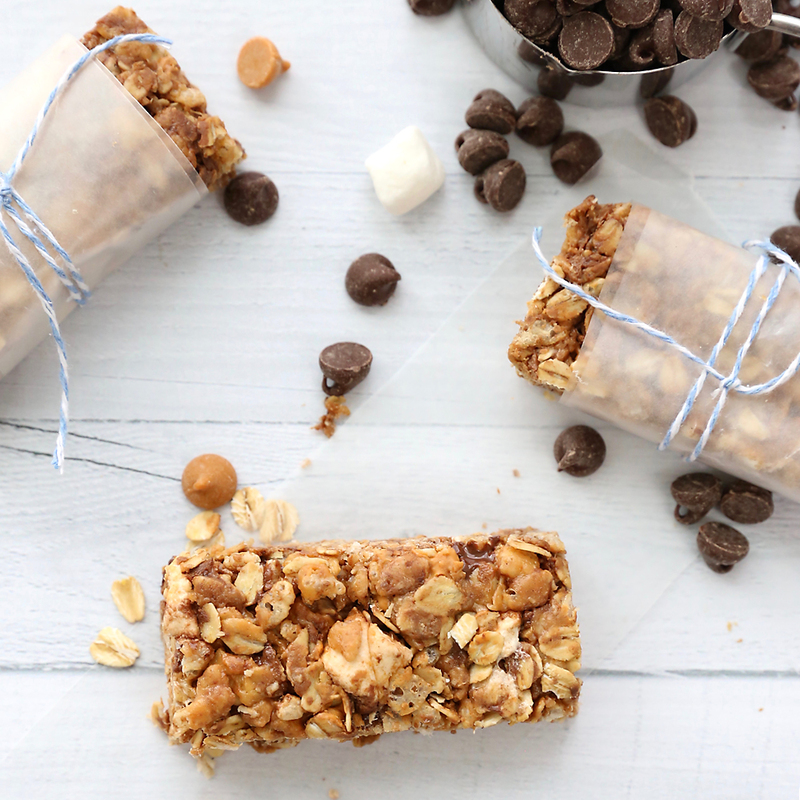 In today’s post: You are going to love these easy to make chewy chocolate granola bars. 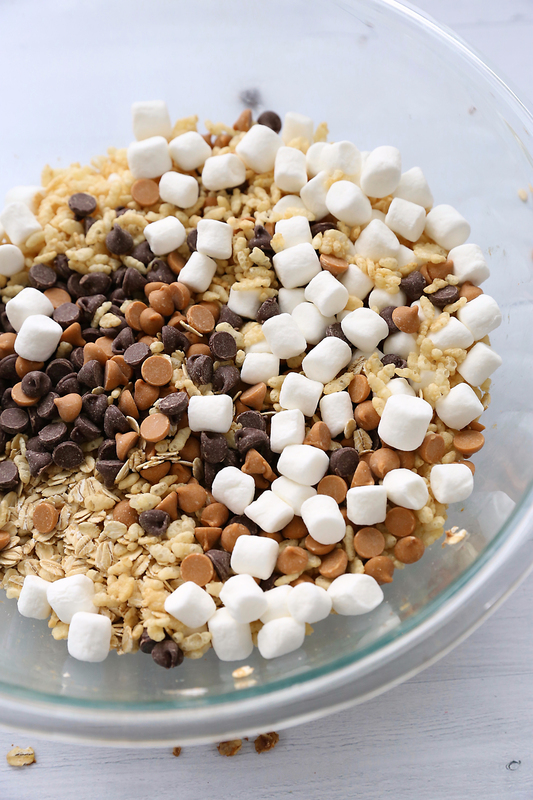 Loaded with oats, chocolate, butterscotch chips, and mini marshmallows, they are the perfect snack! I know that every time a blogger posts a recipe (myself included) she goes a little crazy telling everyone how good it is. It’s like every single recipe is to. die. for. amazing. Right? So yes, I know you’re used to hearing how good things are, but I’m going to say it anyway. These little homemade chewy chocolate granola bars are devilishly good. That’s right, devilishly good. My husband informed me last night (after our family ate almost an entire pan of these in one day) that I’m not allowed to make them anymore because he can’t stop eating them. I agreed immediately. Of course. We need a break from this highly addictive, incredibly easy to prepare substance. Definitely. Except that I like them, which means I’ll probably make them again much sooner than I should. Could I eat the entire pan and have cleaned up all the evidence by the time he gets home from work one day? Likely. 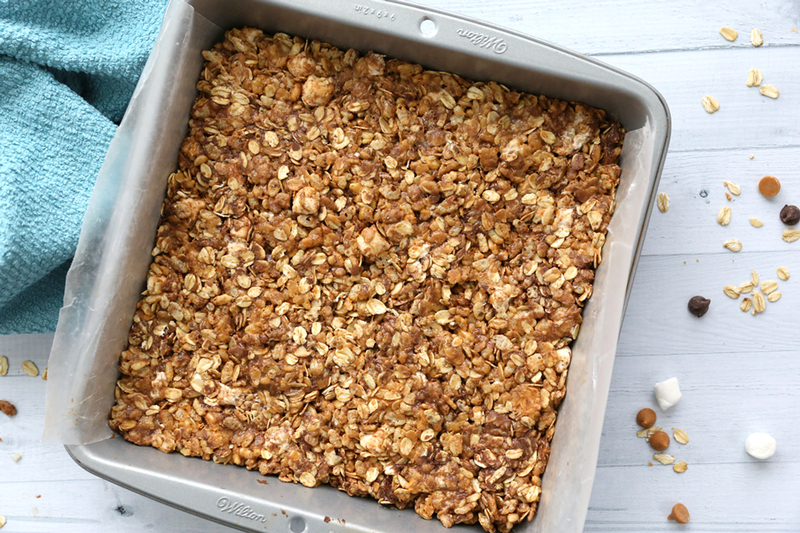 No need to worry – my kids would never let me eat the whole pan without sharing! 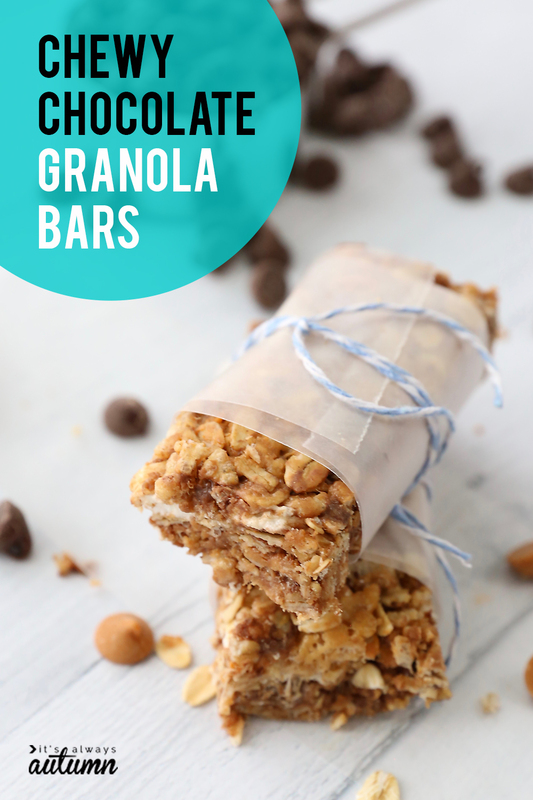 We like to make these bars anytime we’re going somewhere fun that requires a special snack – you know, like camping, to a big family picnic, or downstairs to watch a movie. 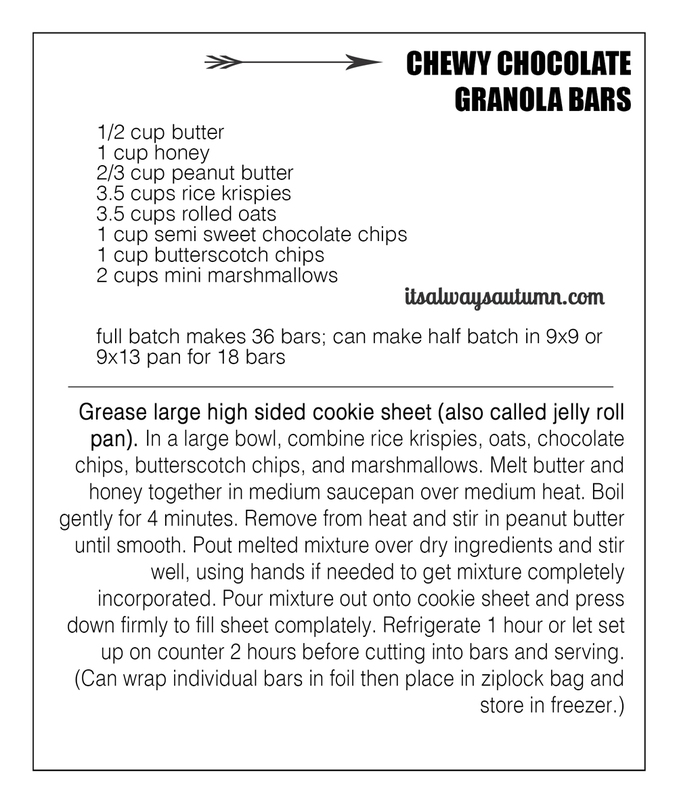 The recipe is large: for a full batch you’ll use a high sided cookie sheet (aka jelly roll or half sheet pan), and will get about 36 bars. You can cut the recipe in half and use a 9×13 or 9×9 pan – that’s what you see in today’s photos and video – and get 18 bars. Watch this video to see how to make them, then get the recipe card and written instructions below. Be sure to get your dry ingredients ready before you start heating the wet ingredients. For a full batch, you’ll need a large bowl to mix everything in (what you see below is a half batch). And stir, stir, stir until it’s all combined. A sturdy wooden spoon works well here, although you may need to use your hands to get the last few oats incorporated. 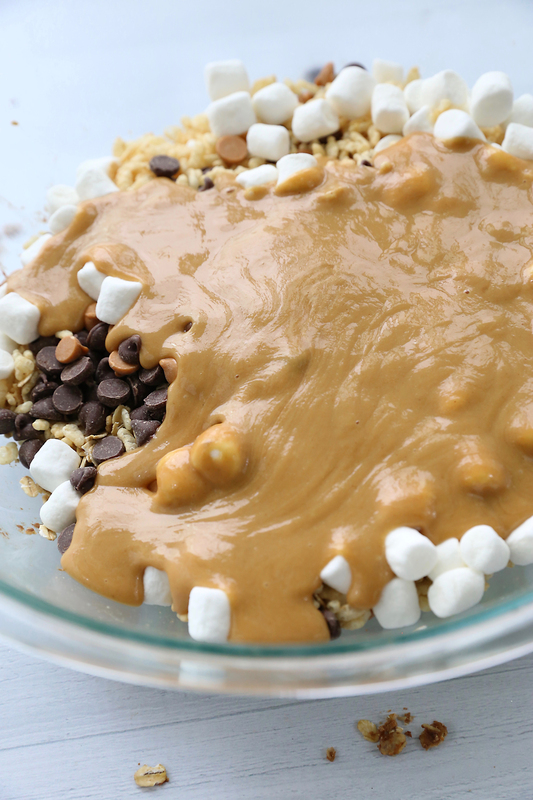 The chocolate and butterscotch chips will melt as you stir everything together, giving the bars a lovely flavor that reminds me of scotcheroos. Press the mixture into a pan and allow to set up before slicing. This looks so amazing! I am going to be trying this when I get home! I am also in love that you marshmallows in it! Can these be made without peanut butter (allergies) ? There are simple website if you are looking for free resources of PUBG game online without any download or registration. I began to use Coin Master Hack from the beginning of the stage, and later cleared the early generation of Coin Master. You have enjoy the working of this website because the most interested content are add this website and you are read the more basic information are provided by the same website setup dual monitor thanks for this website. Have you got a mad idea that we can possibly turn into music? he is off doing that and they’re touring in March.